Fasciectomy (say "fash-ee-EK-tuh-mee") is surgery to cut out a layer of tissue called the fascia (say "FASH-ee-uh") that lies deep under the skin. 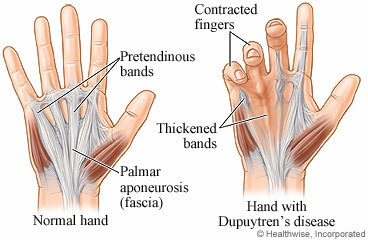 In Dupuytren's (say "doo-pwee-TRAHNZ") contracture, the fascia of the palm of the hand becomes thick and tight. This causes the fingers to become stiff and to curl toward the palm. Removing the fascia can help relax the fingers. This surgery may be done while you are asleep or while you are awake. If you are awake, you will get medicine to numb your hand and prevent pain. You may also get medicine to help you relax. The doctor will make a cut, called an incision, in the skin of your palm. He or she will remove the thickened fascia. The doctor will close the incision in your palm with stitches. After surgery, you will have a scar on your palm and on one or more fingers. This will fade with time. You will go home on the same day as the surgery. It will probably take about 6 weeks for your hand to heal. How soon you can return to work depends on your job. If you can do your job without using your hand, you may be able to go back in 1 to 2 weeks. But if your job requires you to do repeated finger or hand movements, put pressure on your hand, or lift things, you may need to take 6 to 12 weeks off work. For the first few weeks after surgery, you will probably need to wear a splint. You may need to do hand exercises to help reduce the swelling and stiffness. After several weeks, your hand and fingers may be more flexible. You may be better able to fully open your hand. The surgery usually takes 30 minutes to 2 hours. You will have a thick bandage on your hand, wrist, and fingers. You will not be able to move your finger. You will probably go home after 1 to 2 hours in the recovery room. Enter M358 in the search box to learn more about "Fasciectomy for Dupuytren's Contracture: Before Your Surgery".